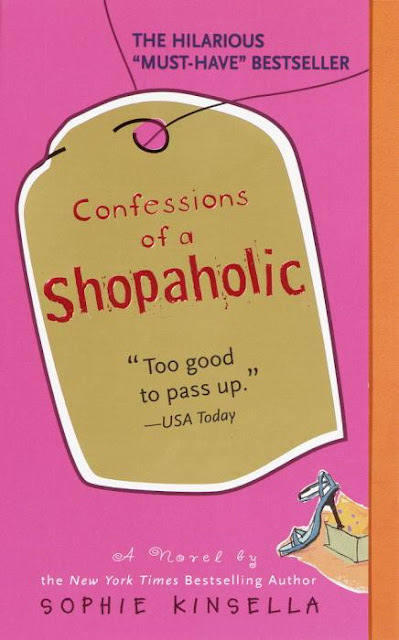 Shazwani Hamid's Blog: Confessions of a Shopaholic the Movie! I really can't wait to watch this movie!! 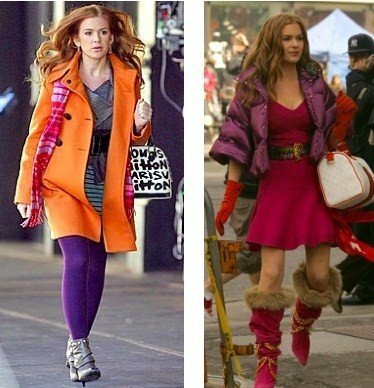 I can't wait to see all those fabulous outfits, what Isla Fisher is wearing! 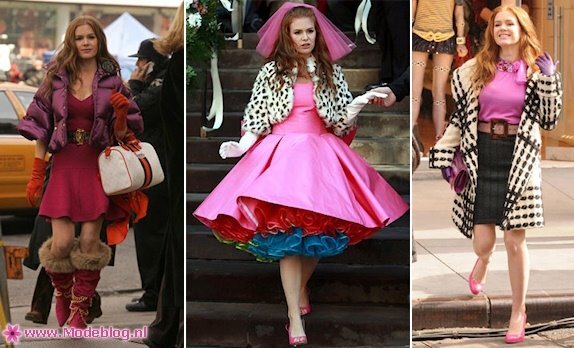 Although in this movie she looks so stylish and fabulous,but for me it's kinda too much of colours la, don't u think? Some of those pieces of her outfits are really crazy, venturous I would say. But some are really nice! But this outfit looks so weird.. I mean, who would wear this kinda skirt in real life? hmm..
and these are some of the shots in the set of the movie.. hmm..I still think that the setting of this movie is supposed to be in London instead of New York. I personally think that british accent is much much fabulous-er than american accent for a glamourous and stylish women..hehe. Oh, I can't wait to watch this movie! Can someone fly me to the US next february,please? Ngeee...i like this movie!! !This lady kindda crazie n daring too..i have a friend staying in US. Normally she will say.."download illegally,sis!" But hey..she did 1 for me for Ron Clark Story..seminggu baru abih download!ngeh2.....wany,where can I buy this book?Kuantan only has Popular and MBS bookstore..any suggestions while waiting for this crazie movie?? I can't wait for the movie too! But why the outfits tak nampak macam Becky sangat eh? (my 2 cent).Some nampak tacky.But i loveeeeeeeee all the handbags.They're fab! OMG I WANT TO WATCH NI!!!!!!! ish now i have to go out teman boss pi guardian sales.. come back time i read!!! hi wanie..salam kenal..im one of your silent reders..ehehe..
btol laaa..prefer gak if buat around uk..mcm ps i love you tuh..dier punye movie da best..tapi baca buku dok terbayang british accent or irish kan..aleh2 american jugak..x best laaa..spoil..yg nih x saba nak tgk jugak..tapi takot kecewa..but sure best kan? ?uk gilos..mesti lambat beberapa bulan citer nih kua nanti..benci!! I'm new here. Visit your blog for a while. OMG...I am waiting for this for such a long time! I have all her collection of books and I love them to bits! I started to berangan bilela movie Si Becky ni nak release since the first book I read.. Hehe..
By the way, thanks for the info! Can't wait to get a copy of it for myself! when i read the books, i never pictured her wearing those kind of outfits. i imagined her style macam ala2 VB. nothing too "outrageous" n colorful like in the movie. huhu. Agreed wif Iza.Kita pun imagine her style agak posh skit.Tu yang terkejut bila tengok camni. miss froggie: urm..popular kat sana takde ke? i penah beli one of her books kat popular gak.. yg lain2 i beli kat mph n kinokuniya..
tu la pasal kan..nanti dah la the second one, becky will move to manhattan..so nnt caner..dah lain plak cerita.. iskk.. ke diorang mmg tanak buat cerita dia yg the second n third n fourth n fifth?? uwaaaaa!! i nak dia sambung2!! hehe..